The majestic mountain scenery dotted with tiny hot-spring towns, which is typical of the Japanese countryside, has given rise to the famed onsen culture of Japan. Hoshino Resorts KAI Kaga is located in Yamashiro Onsen, which is part of the wider Kaga Onsen area in Ishikawa Prefecture, located just off the Sea of Japan. This accommodation facility offers the ideal base for enjoying the onsen culture of the town and exploring the beauty of the surroundings. Pulling up to Hoshino Resorts KAI Kaga in the midst of the autumnal leaf season was a treat for the senses. Yamashiro Onsen, with a history that goes back 1300 years ago, is a town where visitors can find the best of Japanese culture. KAI Kaga’s entrance building, sitting on the town's main square, is a 200-year-old ryokan (Japanese inn) with ochre-red wooden walls and a cobbled entrance leading to a garden that is aglow with fiery maples, a wonderful introduction to the warm welcome that was waiting. Traditional Kaga craftsmanship was of the utmost importance in the design of KAI Kaga. The simple tatami floor juxtaposed below the wooden latticework ceiling, all joined, I’m told, without the use of anything but strategically cut cavities, is very impressive and totally stunning. A chandelier of falling snow, made of koyori (*1), is hanging from the solid ceiling. It’s magical! This is a type of local craftwork called mizuhiki. The snowy effect against the warm wooden walls immediately gives an aura of comfort and I can’t wait to see the rest of the ryokan. *1 Koyori... Thread made out of twisted strips of washi (Japanese paper). The meaningful details continue through the rest of the ryokan. After checking in, tasty ‘Kaga bocha’ tea, made from the roasted stems of the tea plant, is served in the Travel Library, from dazzling Kutani porcelain cups. Kutani porcelain is another local craft that has become renowned throughout Japan and overseas because of its brilliant designs and exceptional quality. It is characterized by ‘Kutani gosai’, five vivid colors - red, yellow, green, purple and blue, that have been used in the decoration of this porcelain since the birth of this craft. These five colors lend themselves to many of the exciting decorative accents that bring the hotel to life. Taking tea with a view of KAI Kaga’s Travel Library is just the start of the relaxation that awaits. The rooms, luxurious and spacious, fuse warm contemporary design with yet more local craftsmanship. Intricate mizuhiki embellished sliding doors separate the bedroom from the sitting area, where a set of Kutani porcelain teacups and pots awaits for your tea break. The soft beds beckoned as soon as I entered my top floor room and an extra gold star was awarded for the onsen balcony bath that was ready and waiting to ease into upon my arrival. 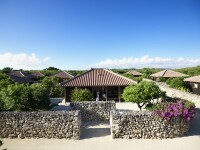 For more information on the rooms available at KAI Kaga, please refer to their official web page. KAI Kaga is clearly defined by its appreciation for local craftsmanship. There’s a first floor gallery dedicated to the works of Kitaoji Rosanjin (1883 - 1959), a famous Japanese artist whose work left a lasting impression on modern-day Kutani porcelain ware. Rosanjin used to frequent the old ryokan that sat on this site, leaving to them a collection of his original artworks, including paintings, pottery and calligraphy. Rosanjin was also known to enjoy the ryokan’s traditional tea ceremony room, Shiian, which is tucked away in the dry landscape garden at the rear of the ryokan. The building was designated a National Important Cultural Property. Shiian is now a tranquil respite from everyday troubles. Every day from 15:00 to 18:00, KAI Kaga guests can visit Shiian to take part in a tea ceremony and enjoy tea and Japanese sweets in a truly authentic setting. Guests staying at KAI Kaga can use Kosoyu, the town's renowned public bath, free of charge. It is located right in front of the ryokan, and can be used at any time. The surrounding onsen town is a nature-rich environment that is a treat for the eyes in any season. 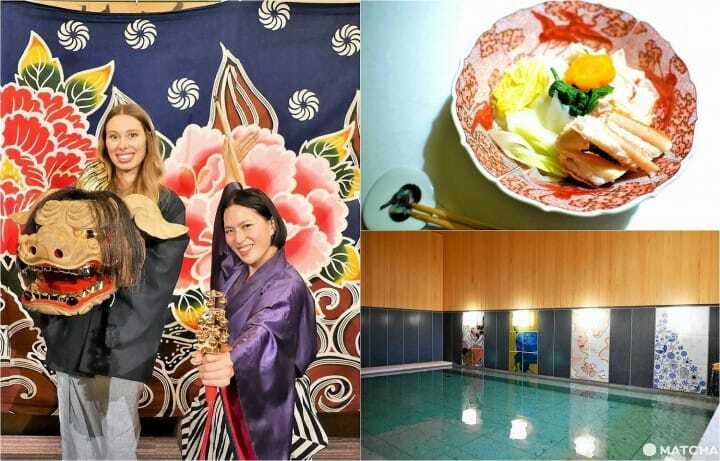 Check out the details of other exciting activities available at KAI Kaga on their official website. Now, of course, to the bathing, this being an onsen town after all. On the first floor of KAI Kaga's main building, there are beautifully designed communal (men and women separated) hot spring baths. The indoor baths are designed with striking yet delicate Kutani porcelain panels representing the ever-changing four seasons of Kaga. They are each hand-crafted by local artisans, whose works also include the beautiful tableware used at dinner and available to buy in KAI Kaga’s souvenir shop. The serene setting also offers semi open-air soaks overlooking the picturesque bamboo-walled garden. After taking a relaxing bath, how about enjoying a massage? Muscle-melting in-room Shiatsu-style massages are available and are so good that they instantly transport you to a state of pure relaxation. Find out more about the excellent hot springs available at KAI Kaga by taking a look at their official website. The food is as impressive and aesthetically pleasing as the porcelain on which it’s served – a concept that is taken very seriously at KAI Kaga, which adheres to the words of Rosanjin when he said that “tableware is the kimono of food”. Dressing up the meals with the most breathtaking of Kutani porcelain pieces, dining at KAI Kaga really is a treat for all of the senses. Dining takes place in the second-floor restaurant, which is separated into elegant private-style dining rooms each adorned with locally-crafted paper washi lanterns and divided by latticed wooden partitions. Dinner is heaven for Japanese food-lovers: winter sees an exquisite multi-course kaiseki feast with famous local snow crab as the star of the show. The many dishes during my visit ranged from sweet sashimi to shells grilled at the table and even a whole crab, wrapped in seawater-soaked rope and steamed. After dinner, guests are invited to watch the Shishimai lion dance in the Travel Library, a traditional cultural performance that is certain to reinvigorate your senses after the incredibly tasty dinner course. Breakfast, also served in the restaurant, is again a thoroughly Japanese affair, with rice, grilled fish, the town’s famed onsen-cooked eggs (which are similar in texture to poached egg but cooked low and slow to ensure a very soft consistency), all washed down with a local, seasonal juice. Although the ryokan does not serve Western food, dietary requirements are easily catered for if discussed in advance. To find out more about the cuisine served at KAI Kaga, please refer to their official web page. Yamashiro Onsen is an ode to Meiji era (1868-1912) aesthetics and everything about KAI Kaga transports you to a state of rested repose, but with all the modern amenities you could ask for. The staff is pleasant and helpful without being obtrusive, going out of their way to make your stay as enjoyable as possible. The facilities are as hands-on as you want them to be, without being inescapable. In-room relaxation is just as encouraged as visiting the tea house or soaking in the onsen. In short, KAI Kaga is the antithesis of big city buzz and the perfect place for couples and families to while away a few peaceful days in a truly authentic Japanese onsen town. To check room availability and book your room at Hoshino Resorts KAI Kaga, please refer to the official booking website. Disclosing The Charms Of Kaga Onsen Village In Ishikawa!